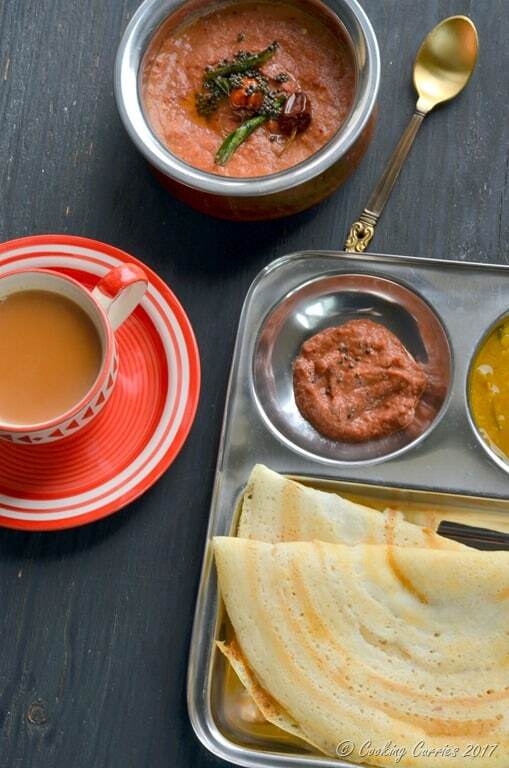 Freshly made onion tomato chutney and a nice hot pot of sambar can make any dosa or idli breakfast complete like nothing else can. I am very homesick today. I miss my parents. I miss being home, being with them, talking about food, drinking a hot cup of chai while sitting on the swing in the living room while watching appa chopping vegetables sitting at the dining table and amma cooking in the kitchen. Sometimes all these images come flooding to my head along with a boat load of memories. I am thankful to have spent a lot of time with them last year and I really hope for more time this year as well. Along with all those memories came these memories of this onion chutney. This onion chutney with tomato or what we call ulli (onion) chutney is sort of a local hero. For the entire four years of my college, where I was one of the very few who lived in the same town as my college and commuted to classes daily from home, my house was sort of a local restaurant to a lot of my classmates. Those who missed homemade food, those who missed home and those who just couldn’t eat any more of the food from the hostel mess. 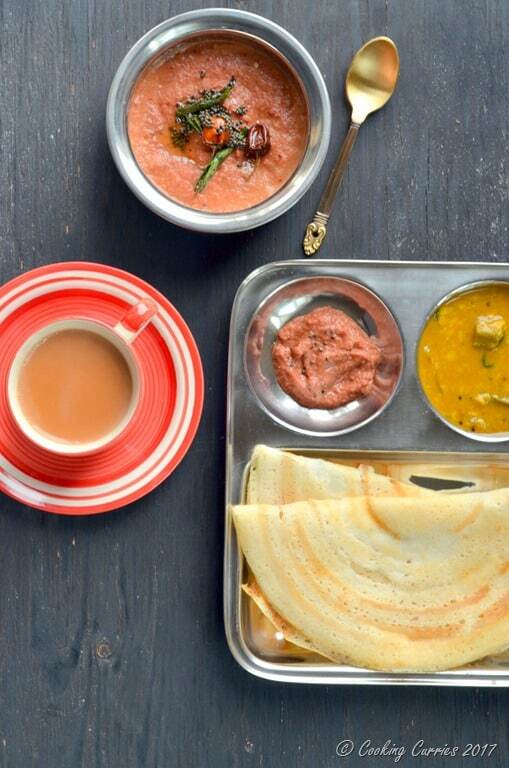 Anytime, anyone knew that Amma made this Onion Tomato Chutney for breakfast or dinner the last night, they will beg me to come home with me and beg amma to make some dosas for them so they could eat this. I love this chutney as it is to eat with dosai or idli but I was such a brat then and would ask my mom to make sambar to go with it as that’s how I liked it the best. And she would make it too, most times. Now, I know better and think that maybe I should not have been so stubborn. 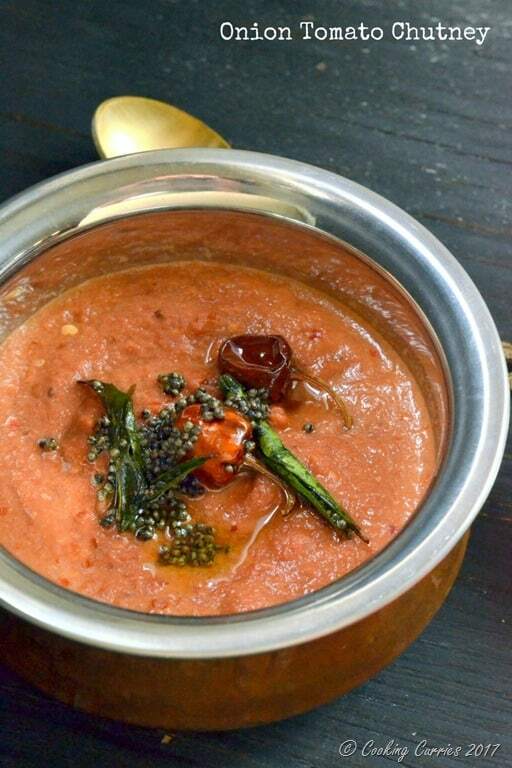 But there is something mesmerizing about the combination of this chutney with sambar on every scoop of dosai, that you just cannot explain and something that no other food combination has or can ever will, at least for me. So here is me, letting you in on one o f my favorite culinary indulgences. Hope you enjoy it as much as I do! Heat 1 tbsp oil in a kadhai / heavy bottomed pan and add the chopped onions to it. Sauté till the onions start to turn color and add the tomatoes and the 3-4 dried red chillies to the pan. Once the tomatoes soften a little, remove from heat, transfer to a plate and let it cool. Once cooled down, blend them in a mixer grinder or a food processor along with some salt. Heat the rest of the oil, add the mustard seeds and once they splutter, add the curry leaves and dried red chillies. 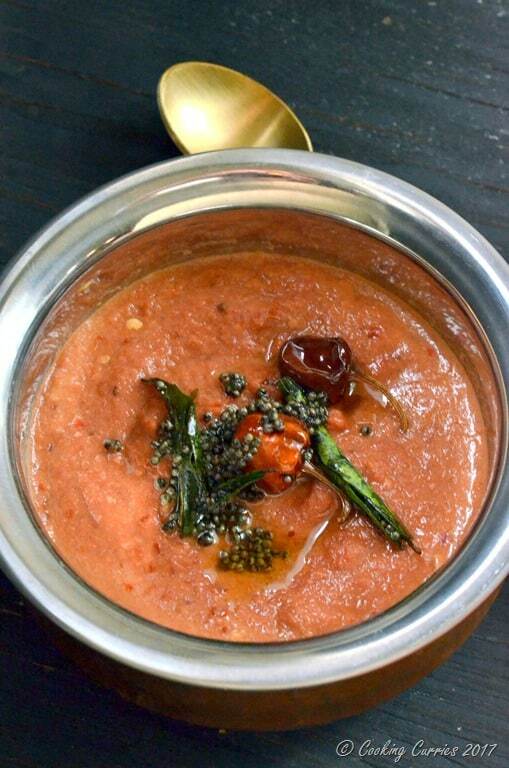 Pour this over ground chutney and serve with dosas or idlis.